Delivered fully built, just straighten your bars, fit pedals and go! Please note that we are unable to ship this Scott Scale RC 900 SL outside of the UK. This is at the request of Scott Sports. This Scott Scale RC 900 SL 2019 is available with our legendary Podium Point free accessory scheme. The Scott Scale RC 900 SL features the very best carbon fibre hardtail frame available. Created using Scott's HMX-SL carbon fibre, the Scale RC SL frame weighs only 879g (average weight, Medium size)!! As well as a higher grade of carbon fibre, the Scott Scale RC 900 SL features Shaimano's all new XTR 12 Speed drivetrain, Shimano XTR Brakes, Fox SC 32 Factory fork and Syncros Silverton 1.0 carbon wheels as upgrades over the Scale RC 900 World Cup. Scott's Scale has set the standard for cross country hardtails for over a decade. Renowned for their low weight, excellent lateral stiffness and vertical compliance, Scales offer everything you could want from a cross country hardtail. The latest Scale frame has been developed with the help of multiple World, and Olympic Champion Nino Schurter and has several World Cup wins to its name. The SL version use the highest grade of HMX-SL carbon composite and is designed specifically for 1x11 drivetrains. With SDS2 shock damping technology, Boost hub spacing, modern race inspired geometry and the latest carbon fibre layup technologies the Scott Scale retains its place as the very best cross country hardtail available today. The Scott Scale RC 900 SL features 29" wheels with excellent roll-over characteristics. The big wheels are great for rolling over nasty roots and rocky sections, essentially making it easier to ride these conditions. Improved traction is also a key factor with the increased wheel diameter compared to smaller wheels as tyre contact to the ground is larger. The Scale RC 900 SL features a Shimano XTR 12speed drivetrain with a singlering Race Face Next SL carbon fibre 32Tooth chainset and a 10-51 tooth rear cassette for a huge gearing range whilst maintaining the simplicity and low weight of a 1x system. Shimano's XTR brakes offer huge stopping power with a lightweight, controllable, action. Fox's SC 32 Factory fork provides 100mm of controlled travel which is enhanced by Scott's unique 3 position Rideloc remote system which allows on the fly adjustment of the fork from locked out through short travel to fully open. If you're looking for the ultimate hardtail, look no further than the Scott Scale RC 900 SL. IMPORTANT: This bicycle requires a suspension pump to set and tune its suspension correctly. This is not included as standard. 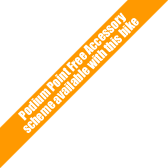 A suspension pump can be selected for no cost using Podium Points™.